It’s happening. The holidays are here and the chilly breezes of the season are about to have their way with us. The upside of cooler days? 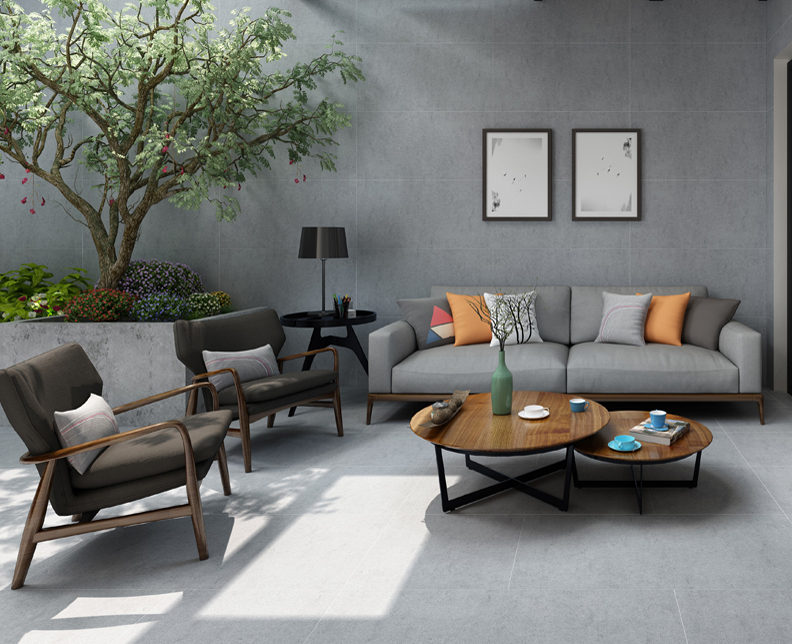 Focusing our attention on all things home – including quality time with family and friends. On the workfront, our super busy design team was spotted this week at their annual retrospective, choosing their favorite looks of 2016. Since the kitchen is the heart of the home—especially around the holidays—our smart-dressed crew (they’ve got the whole layering thing down to an enviable science) focused on these spaces. 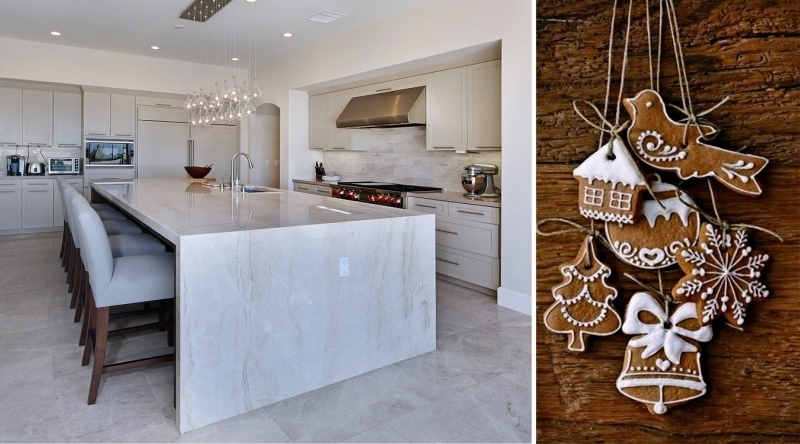 And just in time for seasonal entertaining, our in-house stylists serve up simple ways to add a little holiday glam—with long-loved festive accents—to any style kitchen. Featured: The massive waterfall island in Taj Mahal Quartzite with matching floor tile steals the spotlight in this uber-modern monochromatic kitchen. Waterfall islands. Lovelier words have never been said together. They may conjure up a hotspot in Hawaii, but to us, a trip to this kitchen looks dreamy enough. White marble looks are the gold standard right now, so it’s fortuitous that this milky-hued Quartzite has wispy golden veins. 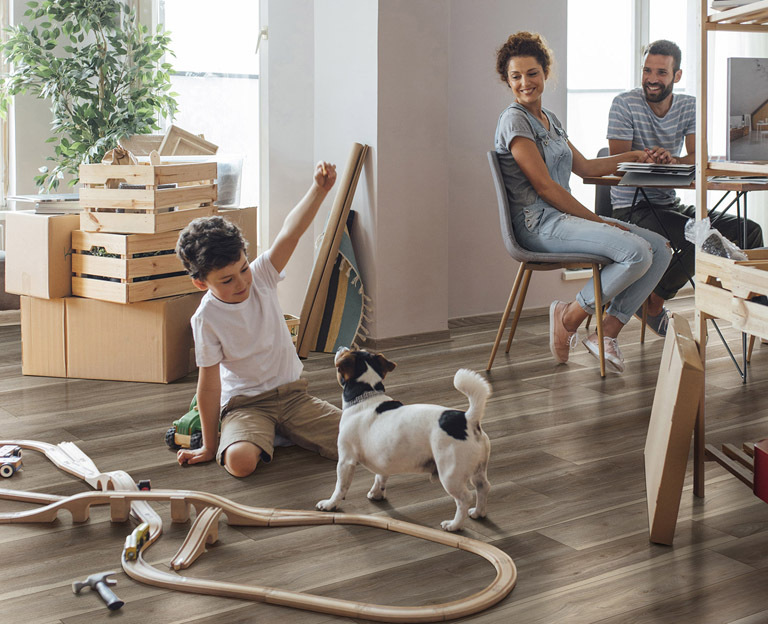 Taj Mahal, a glamorous yet kid-friendly option, lives up to its grand name by being more durable than most countertop surfaces. We love how clean, fresh and modern this space looks – especially with the sleek pendants and chrome details. Surely, this kitchen was designed for entertaining. Eggnog anyone? Seasonal tip: Nothing looks merrier or smells better than gingerbread garland hanging in your kitchen – with the possible exception of a fresh fir and spruce wreath. See on Pinterest. Featured: We credit Cashmere Carrara Quartz countertops and Highland Park’s Whisper White subway tile, and Arched Herringbone decorative mosaic tile (above the stove), for giving this space its halo-like look. We’re just going to call this kitchen pure happiness. It’s not just heavenly to look at, but it proves that you can bring both traditional and modern influences together to create a timeless and elegant space. Trending pale gray cabinets and a white subway tile backsplash brings the fresh look home – especially when paired with our family-friendly ivory polished quartz countertops. This bright and cheery cooking space is anchored by porcelain floors with an upcycled rustic look. Too vanilla for your taste? Bright-hued metal chairs are perfect for bringing a punch of color to kitchen islands. Seasonal tip: Fill crystal bowls with clementines, seasonal greenery, or ornaments to add a light sparkle to your room. See on Pinterest. Featured: Dark gray and tan veins swirl throughout the Pacific Salt Quartz countertops, which stands out against the 4” x12” subway tiles in Highland Park Antique White. 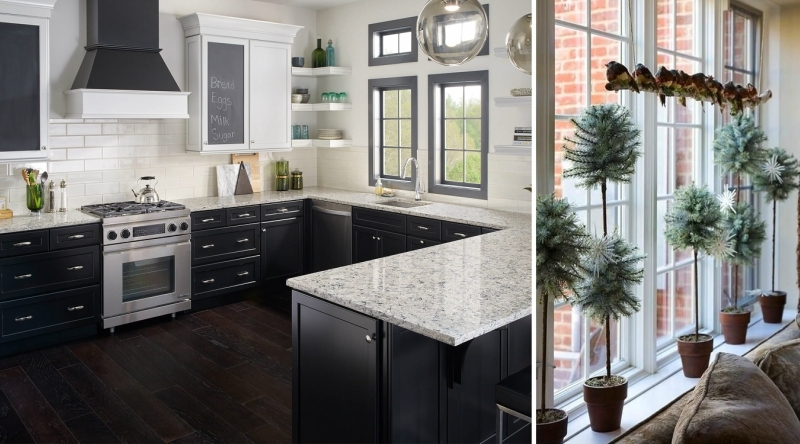 We had to include at least one black and white kitchen in the bunch because this pairing is growing more popular by the minute. In this space, two classic colors conspire to make one clean and chic design. A nod to fashion’s color block style, it’s designed sunny-side up: stark white walls, light countertops, and an ivory subway tile backsplash shine above the dark floors and lower black cabinets. The eye-catching glass globe pendants add a minimalistic accent to this high-contrast space. Does it get any better than this tailored look? Perhaps only if your inner circle was milling about and socializing. Seasonal tip: Nothing says yuletide aroma like fresh evergreen branches. Put them in a Mason Jar or arrange them on a window ledge. See on Pinterest. Featured: Calico White Quartz anchors this space and looks stunning paired with Highland Park 3” x 6” subway tiles in Whisper White. 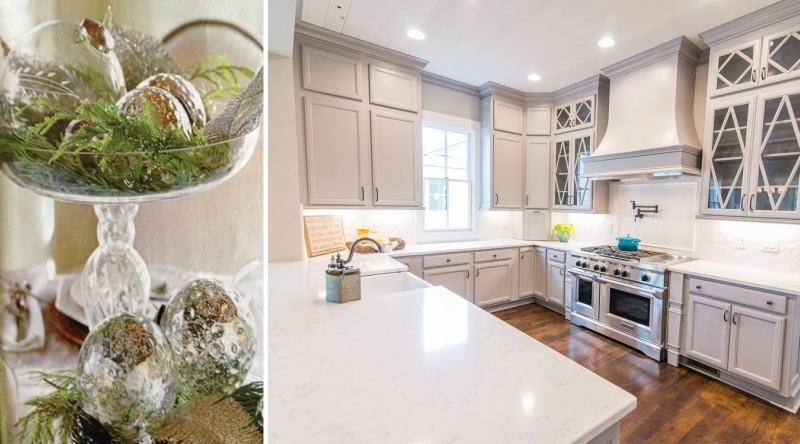 While we adore the all-white kitchen trend, some homeowners prefer their hot cocoa in warmer, cozier spaces. Classic elements like caramel-colored cabinets and woodsy-style ceiling beams converge with modern subway tile and creamy quartz countertops to give this space a soft-contrast Scandinavian feel. 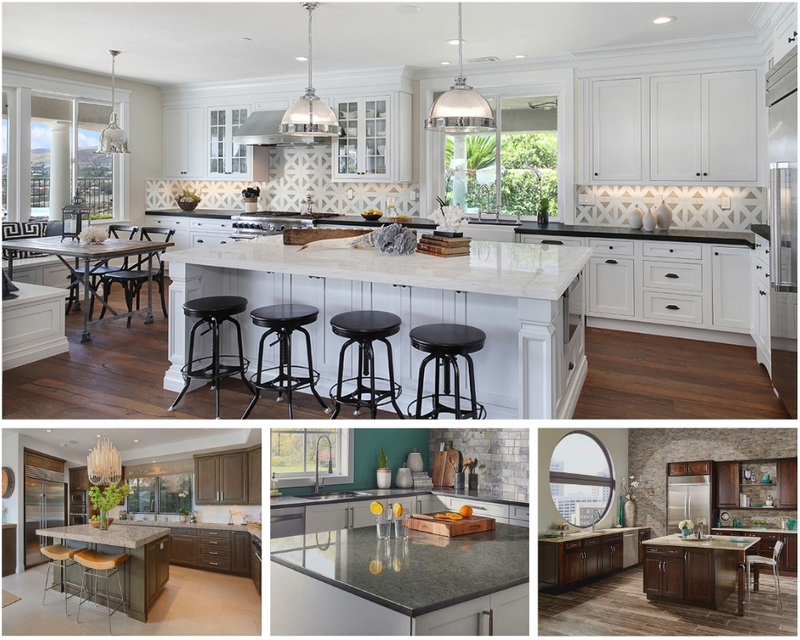 For family life, we’re all about the modern ease and elegance of quartz surfaces – especially when paired with edgy accents like retro metal stools, and industrial-inspired pendants. For a deeper-toned traditional look, pair Caravelas Gold Granite countertops with a Taos Picket backsplash. Seasonal tip: Hang glass stars from your chandelier and weave evergreen boughs through the arms. See on Pinterest. 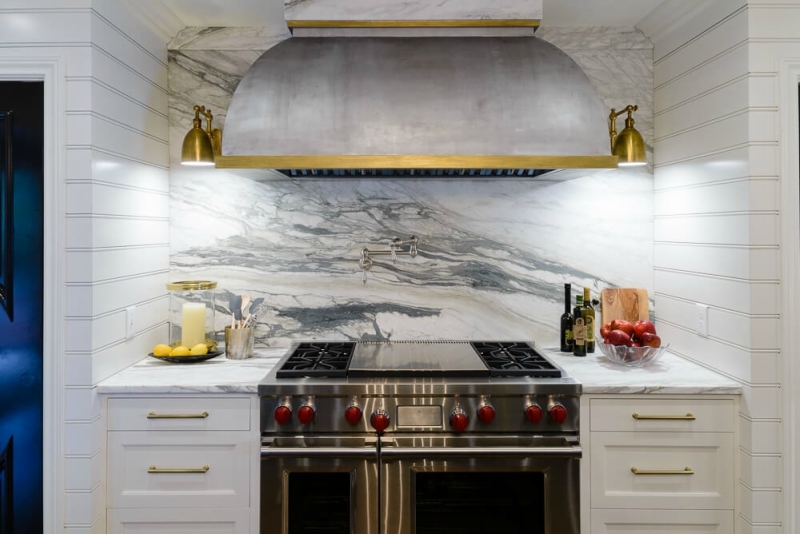 Featured: Calacatta Black Marble countertops and backsplash gives this enchanted seaside kitchen its chic edge and drama. If a modern lady and a ship captain got together and designed a kitchen, it might look something like this. The countertops and backsplash are a sea of marble—complete with dramatic gray veining (be still our hearts). This is one of our favorite looks because it screams quality construction down to the fine details: Shiplap walls, commercial grade appliances, an ink-navy island, and brass and brushed nickel hardware. Just add wine, friendly neighbors, and salty sea air. 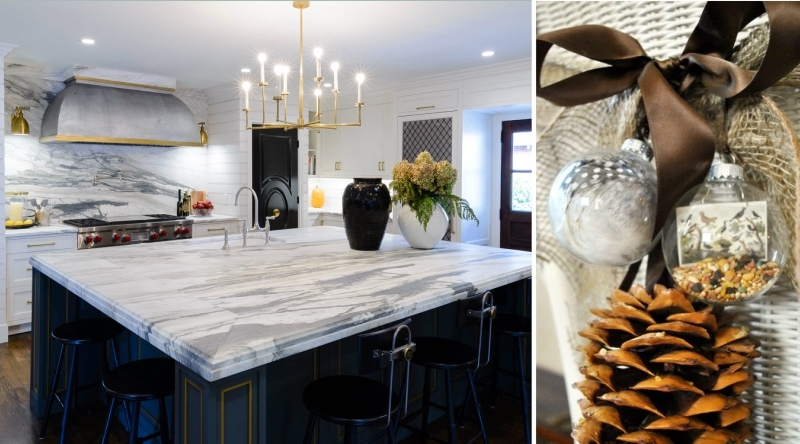 Seasonal tip: Drape pine cones with ribbon over the back of your kitchen island chairs. See on Pinterest. Wherever the season takes you, we hope that our top picks for 2016 have inspired you. 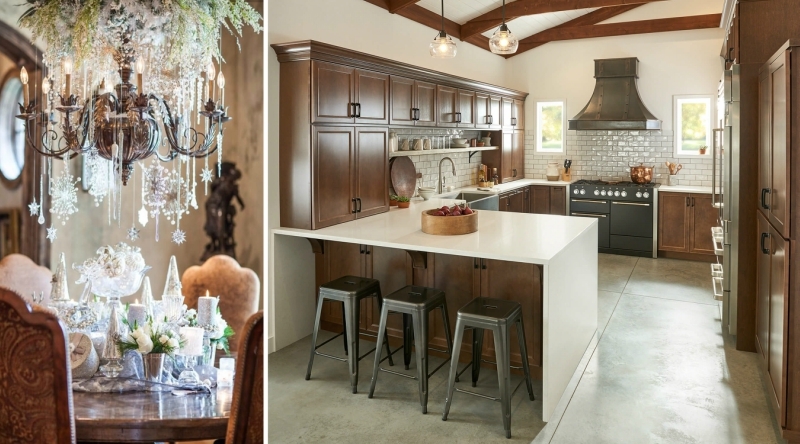 Join us on Pinterest to see our favorite decked-out kitchen ideas. Outdoor Oasis: Is It Time to Update Your Shower? Tips from the Trade: What is Inkjet Glass Tile? Tips from the Trade: What is Nanotechnology? Tips from the Trade: What is Quartz and How is It Made?